Jessie Hurley is at OCS!! Jessie Hurley is at OCS this week teaching...we are so very lucky to have her!! 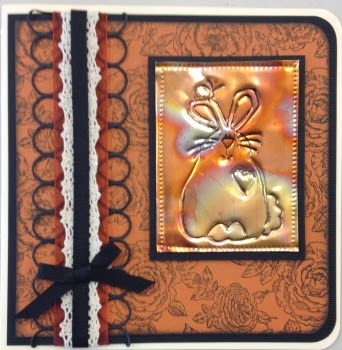 I wanted to share one of the cards the ladies are doing in her Copper Class. 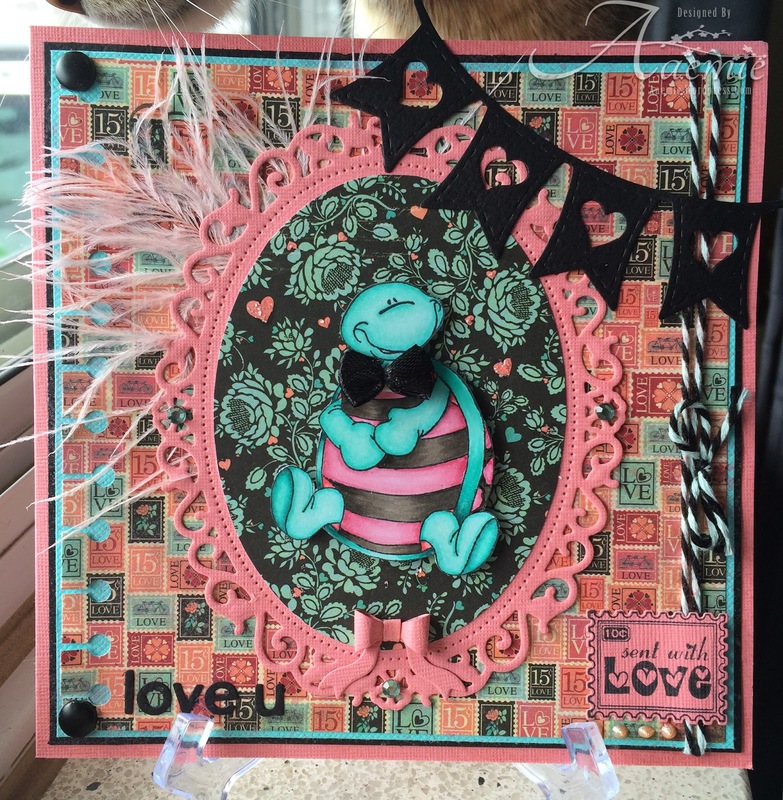 Since it is the last day of February which means the final day for our amazing feature company High Hopes Rubber Stamps I chose Jessie's card using Hare's My Heart. This card in the REAL is totally amazing, just an FYI my photo skills are not all that great. I also want to say THANK YOU to Jessie for coming to OCS and providing such AMAZING classes for all the ladies. I know we are only on Day 2 of 4 but the ladies are having a fantastic time..so thanks to Jessie! Can't wait for her to come back again in June. Wacky Wednesday is here again and this is the final week that OCS is showcasing High Hopes Stamps as the featured Stamp Company of the month. 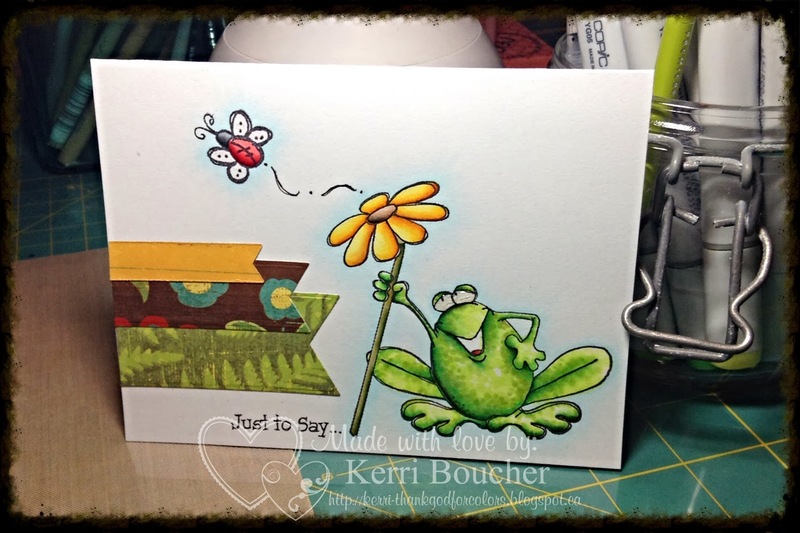 For today's post, I have used this cute stamp called "Washed up Waterbug" and Laughing sentiment from High Hopes. There is still a bit of time to enter this month's "Anything Goes" challenge for a change to win a High Hopes prize package from OCS. 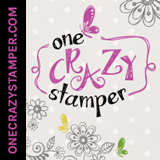 Do stop by Lora's One Crazy Stamper store for some amazing products. Make sure you pay a visit on Saturday as it is the start of a brand new challenge at OCS. My card features another adorable image from our sponsor this month HIGH HOPES and is entitled Smiling Shelby and can be found here. I colored the image with Copics, then fussy cut it out and layered it over some scraps of Bo Bunny paper. The sentiment is from my stash. There are still a couple of days left to enter this month's challenge for your chance to win a great prize!!! Smiling Flowers and Sending Hugs! Thanks for stopping here and please go over to One Crazy Stamper, you still have time to enter our challenge "Anything Goes" for the month. Awesome prizes. The stamp company we are show casing this month has be High Hopes Rubber Stamps. They are so very cute, and fun to color up. I am using this next one called Smiling Flowers, and Sending Hugs! Thanks again for stopping and I hope you get a chance to play along at One Crazy Stamper. Till next time Happy Crafting! Supplies: Stamps-High Hopes Rubber Stamps, Ribbon, Pearls, Flowers, Spellbinders, Embossing Folder, Glue Dots, Copic Markers-G99, G94, RV09, RV14, RV13, RV21, 0. Have a wonderful day crafty friends! As you can see in the photo I used acetate to make a "window" in the card so that both images would be together in the scene. I also added grass boarders to create the background effect along with a strip of "dirt" created using a Cricut Cuttlebug Embossing Folder called Tiny Bubbles and the background sky using the Skyward Cloud Embossing Folder on both the card front and the blue sky in the background. Here is a view of the inside of the card where I continued the embossed clouds and also added a pocket and some Herb seed packets to make this card a perfect gift! Have a great day and make sometime to create!!! It is another Wacky Wednesday with more wacky weather on the way. I do know I am definitely ready for spring and nicer weather to arrive. 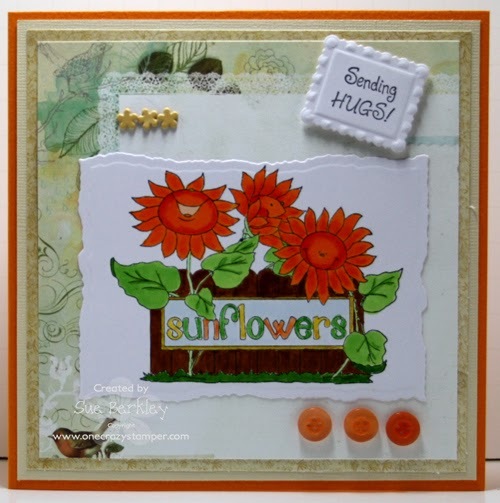 Here at One Crazy Stamper, we are showcasing the latest release from High Hopes called "Ready for Spring"; and for my today's post I am using the stamp called Sunflower Smiles. 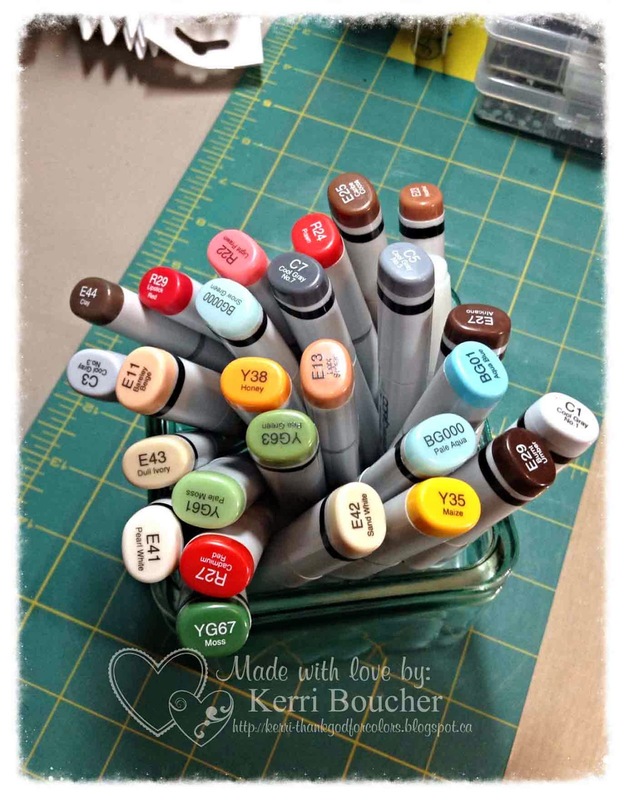 There is still time for you to get crafty and enter this month's "Anything Goes" challenge. For some inspiration check out what the rest of the Design Team has been up to and as well as Lora's OCS store for some amazing new products to inspire your creativity. See you next week and in the meantime have some fun. Today's post is HOT, HOT, HOT!!!! Okay maybe not that hot, but it does feature a cute fireman!!! 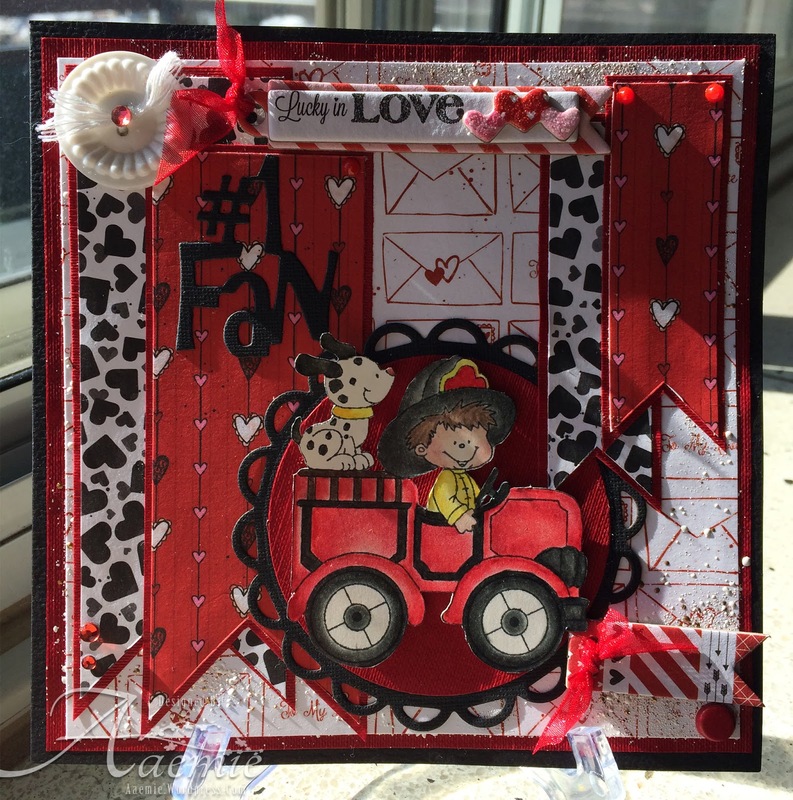 My card this week features another adorable High Hopes stamp called Lil Fireman﻿!!!! I have colored the image with Copic sketch markers, then cut and matted it with a Spellbinder die. The ribbon, Hero brad and sentiment are all from my stash. Wishing everyone a happy day and make sure to take the time to check out all of the wonderful projects from the rest of the design team this month. Another great stamp I used for One Crazy Stamper, "Anything Goes" show casing the company High Hopes Rubber Stamps. 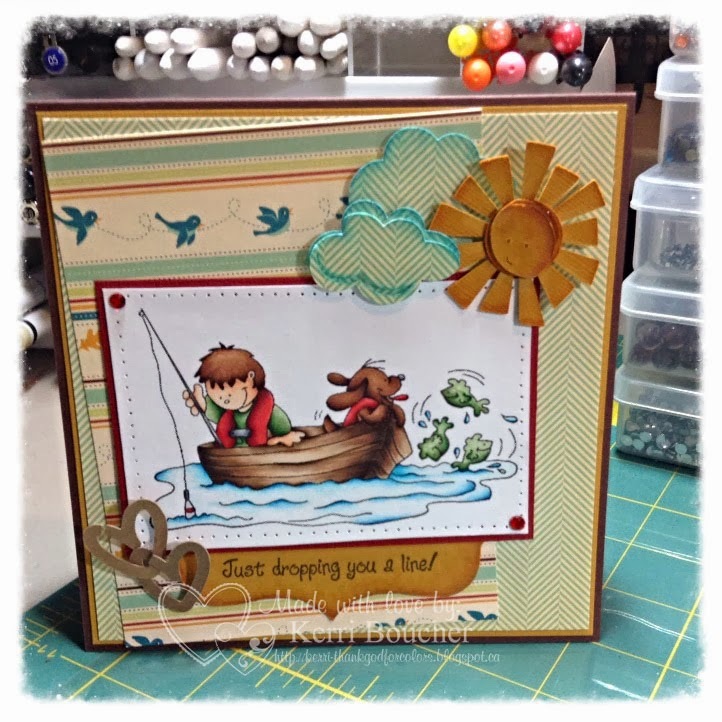 My card was fun to make, I am using the image called Washed Up Waterbug, and Not laughing at you...laughing with you! Used some spellbinders, embossing folder and some foam tape to pop up. Copic markers to color the image. 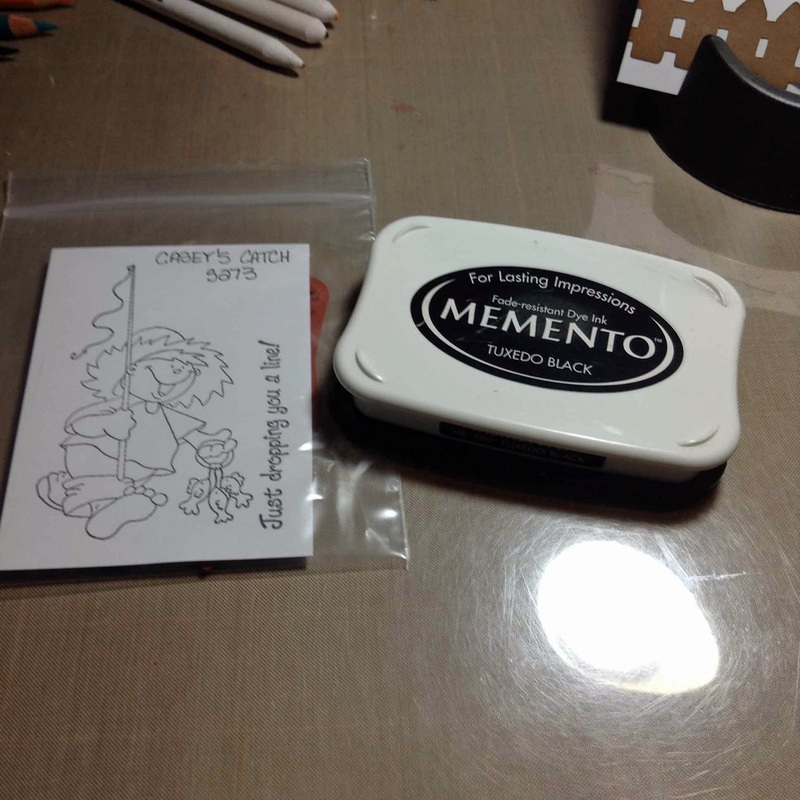 Thanks for stopping, please join us at One Crazy Stamper and have some fun. Supplies:Embossing Folder, Stamps-High Hopes Rubber Stamps, Spellbinders, Foam Tape, Copic Markers-W2, W3, B21, B24, B23, E81, E84, E87, E01, E0000, E00, E30, E31, E33. I know Valentines Day was yesterday, but I am sharing a Valentine today. This totally cute guy was made for my daughter. For this card, I coloured with copic markers, spritzed angel pink Fireworks, added pearl drops, bakers wine, brads, jewels, stickles and attached a pink feather. I have an obsession with a few of my dies, being this heart banner and memory box ribbon. They are too cute to not use as often as possible. Now time for you to get crafty and join our Anything Goes challenge this month! I hope that you enjoyed today's card and wishing everyone a very lovely Valentine's Day! 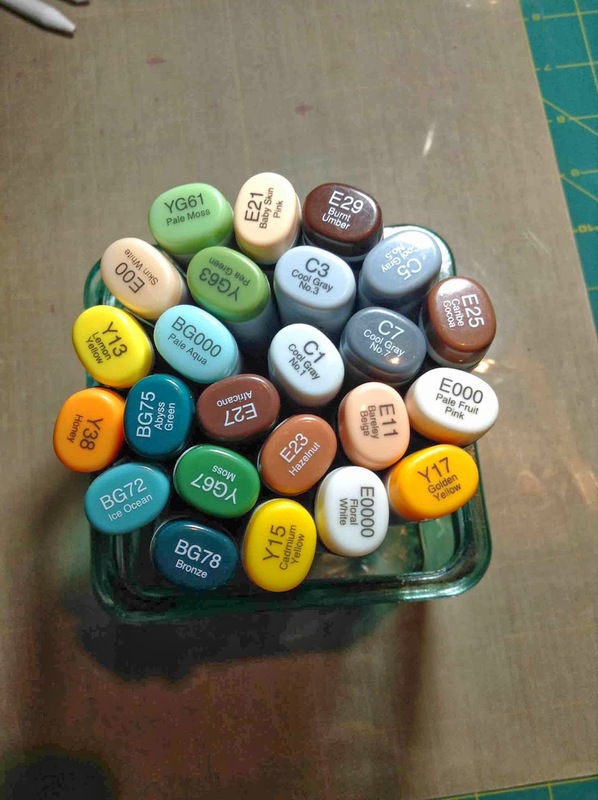 Labels: Copic Sketch Markers, Copic Xpress It Card Stock, High Hopes Rubber Stamps, Memento Inks, Shari G.
A Short Tutorial Shading Around an Image!! Hey there today I have a quick tutorial for ya!! 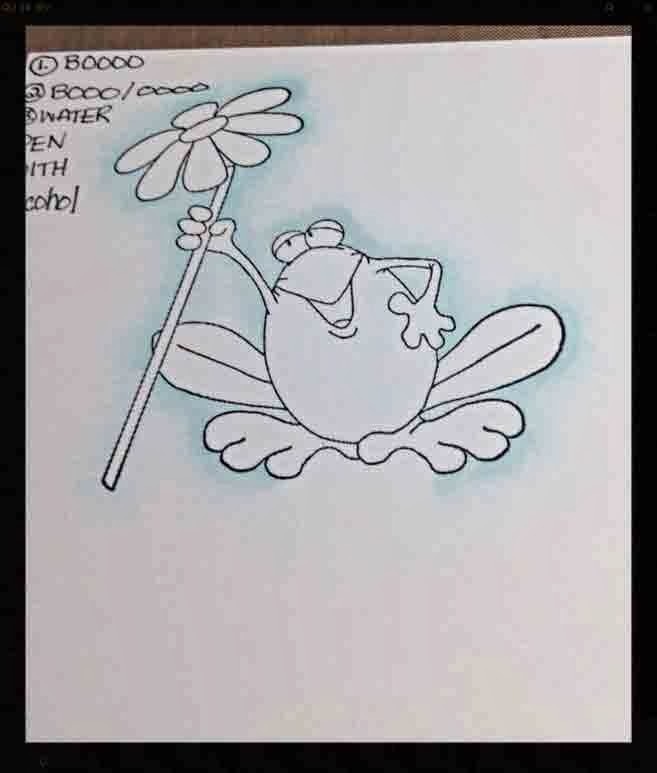 I have decided to show ya how I shaded around some of my images..For this I have chose a HIGH HOPES stamp called FROGGY"S POSEY..I stamped it with MEMENTO TUXEDO BLACK INK onto white card stock. You will need B0000 and B000 as well as a water pen filled with Rubbing Alcohol.. Step 1 take your B000 an flick in an outward motion around your entire image..Once you have finished this take your water pen filled with rubbing alcohol and go over the blue in the same flicking motion..
Once your image has dried take your B0000 and go over the area again flicking further out this time..
Now you will go over again with your alcohol filled pen..Do this as many times as you like until you get the desired effect!! FYI you can do the same with a COLORLESS BLENDER but I prefer the water pen.. Here is the finished card..I love frogs so this image was right up my alley..I coloured using COPICS and then did some shading with my PRISMA PENCILS!! I hope you enjoyed the tutorial and if you have any questions contact me at kluvscoloring@gmail.com.. The supplies I mentioned above can all be found over at ONE CRAZY STAMPER..
thanks again for stopping by and have a great day!!! It is certainly nice to have some warmer temperatures and sunshine after all the snow and ice we have had this winter so far. 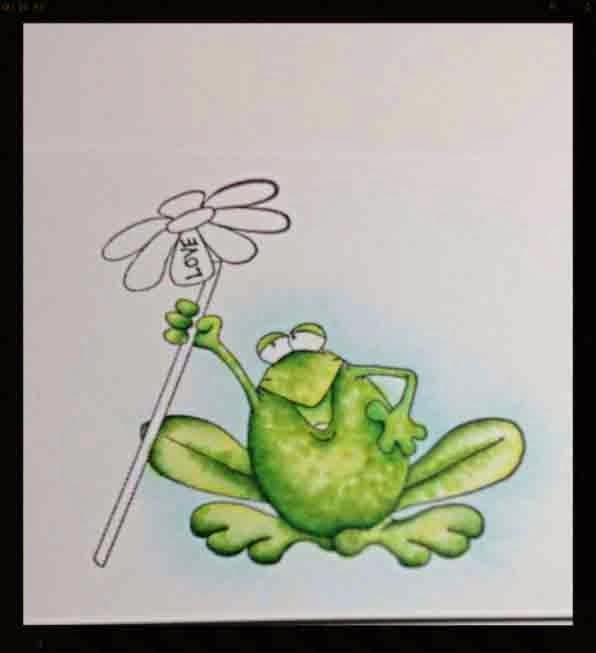 I know I am certainly looking forward to spring and at OCS we are showcasing High Hopes Rubber Stamps latest release which is "Ready for Spring". 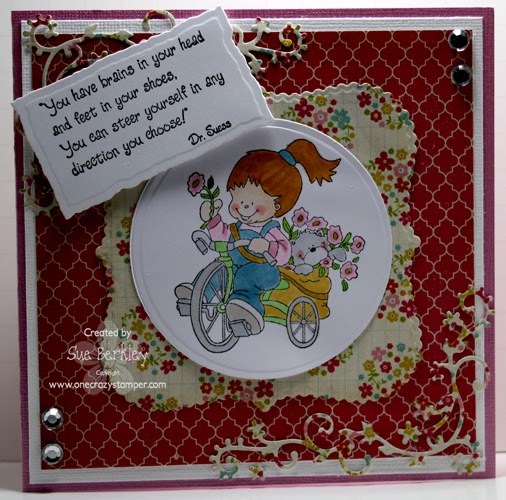 For my post today, I used this adorable stamp from High Hopes called Patty's Posies. After you have uploaded your entry for this month's "Anything Goes" challenge for a change to win a High Hopes prize pack from One Crazy Stamper; why not check out Lora's OCS online and brick and mortar stores for all the new products that are arriving as well as details for the new Crop Club. Until next time, keep busy being creative and have fun. Almost half way through the month already, but you still have lots of time to enter the challenge here at ONE CRAZY STAMPER to win a great prize - check out all of the details here. 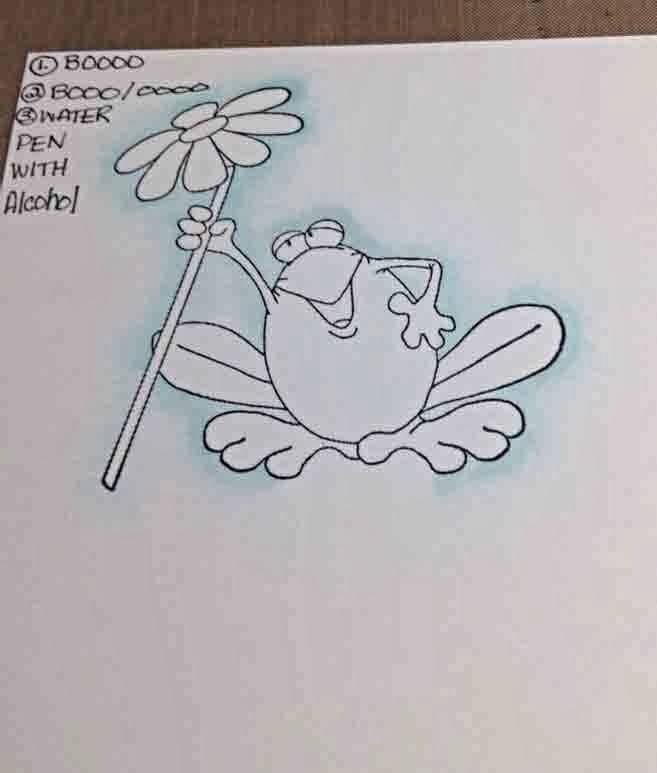 My card today features Lazzy Day Froggie that I have colored with Copics, then fussy cut and placed on the card front amongst waves that were created with a Memory Box die. The sentiment is an oldie from my ever growing stash, and the frame around the sentiment was created with a Spellbinder die. Herbie Sending Smiles, Sending Hugs! Thanks for stopping and checking on what I am creating today for our show case at One Crazy Stamper. High Hopes Rubber Stamps. This one is called Herbie, and I think is pretty cute, with his friends. I also used Sending Hugs, Sending Smiles! Just figured they went together. Please play our challenge at One Crazy Stamper this month which is "Anything Goes", great prizes, and lots of fun. Till next time Happy Crafting! Hope this Warms Your Day! !